If you are reading this, it’s very likely that you are going to vote. The purpose of this column is not to convince you to vote but rather to urge you to convince every eligible voter you know to cast their vote. This is a crucial election. Let’s consider what Democrats are fighting for and why it’s so important that we turn out every eligible voter we can reach. The results of this election will determine the future of our country, the viability of our democracy. Two years of Donald Trump have demonstrated that his basic instincts are non-democratic and that congressional Republicans will not stand up to him. Trump is a dreadful person. Nonetheless, it is theoretically possible for Trump to be a jerk and still be a champion of democracy. Sadly, this is not the case. Donald Trump is a tyrant. His basic instincts are undemocratic — he’s focussed on what’s best for him and absolutely willing to trample on the right of others in order to accomplish his objectives. For Trump, winning is everything; he believes the ends justify the means and that might makes right. But it’s not only Trump’s operational style that is undemocratic, Donald’s morality is similarly warped. Trump’s conduct demonstrates that he doesn’t believe in the Golden Rule; nor does he spend any time seeking “win-win” solutions where everyone comes out ahead. Donald ruthlessly seeks wealth and power. Trump lies in order to further his ambition. He will say and do anything to win. And he will attack anyone that gets in his way. It goes without saying that Trump is a sexist. (He’s an unrepentant sexual predator.) He’s also a racist. These traits are consistent with his dominant behavior as a full-throttle bully. Trump doesn’t believe in collaboration or compromise; he believes in running over people. As President, he has made no attempt to reach out to Democrats or to those who did not vote for him. Donald’s entire focus has been to motivate his base. He is not President for all the people, only those he perceives as being on his side. Therefore, it is true that this election is about Trump. But it’s also true that Trump is not on the ballot. In state after state, Democrats are going after Republican incumbents because they will not stand up to Trump — they will not defend Democracy. After the presidential election, many of us hoped that congressional Republicans would stand up to Trump; we hoped that they would limit his most egregious actions. Our hopes were dashed. Republicans have united behind Trump — with a few notable exceptions such as the late Senator John McCain. A recent NPR/PBS Newshour/Marist poll asked voters about what their top issues were, heading in the 2018 midterm election. 20 percent responded “Economy, jobs;” 17 percent healthcare; 17 percent immigration; 9 percent “taxes, spending:” 7 percent climate change; and 5 percent guns. Trump and the GOP are on the wrong side of all these issues. On August 11th, Forbes magazine (https://www.forbes.com/sites/chuckjones/2018/08/11/trumps-economic-scorecard-higher-inflation-flat-wages-and-a-ballooning-federal-deficit/#55feedfe22fa ) noted that Trump’s economic legacy is “higher inflation, flat wages, and a ballooning federal deficit.” Trump has managed the economy to benefit himself and his wealthy supporters. Trump campaigned on the promise to “repeal and replace Obamacare.” Republicans came within one vote of completely repealing Obamacare. (The latest Kaiser Poll (https://www.kff.org/interactive/kaiser-health-tracking-poll-the-publics-views-on-the-aca/#? ) finds that 50 percent of respondents support Obamacare and 40 percent oppose it.) Trump and Republicans continue to attack Obamacare but have offered no replacement and no protection for 0those with pre-existing medical conditions. Trump and his Republican cohorts passed a massive tax cut that benefits corporations and America’s wealthiest one percent. As a consequence the national debt increased to more than $21 Trillion. The fiscal year deficit will be approximately $1 trillion. Trump’s attitude about climate change has softened. Originally he called it a hoax. In a recent 60 Minutes interview (https://www.theverge.com/2018/10/15/17977596/donald-trump-climate-change-hoax-60-minutes-interview ) he equivocated: “I think something’s… changing and it’ll change back again. I don’t think it’s a hoax… But I don’t know that it’s manmade… I don’t want to give trillions and trillions of dollars. I don’t want to lose millions and millions of jobs.” He’s not going to do anything. Finally, with regards to guns, Trump and his Republican cronies are beholden to the IRA. They don’t want any change in gun laws. In the November 6th election, Democrats are fighting for Democracy. We are struggling to replace a Republican Congress that has been unwilling to standup to would-be dictator Donald Trump. We moving forward with commonsense solutions to America’s most critical problems. Vote. 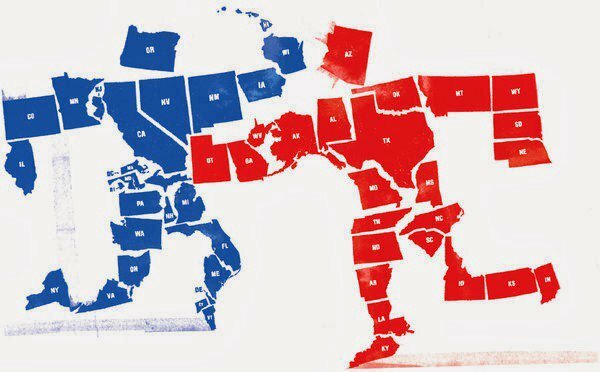 We’re less than two weeks away from the November 6th midterm elections and the strategies of each Party are well defined. Democrats are determined to rally their base and to encourage Independents and inconsistent voters to go to the polls. 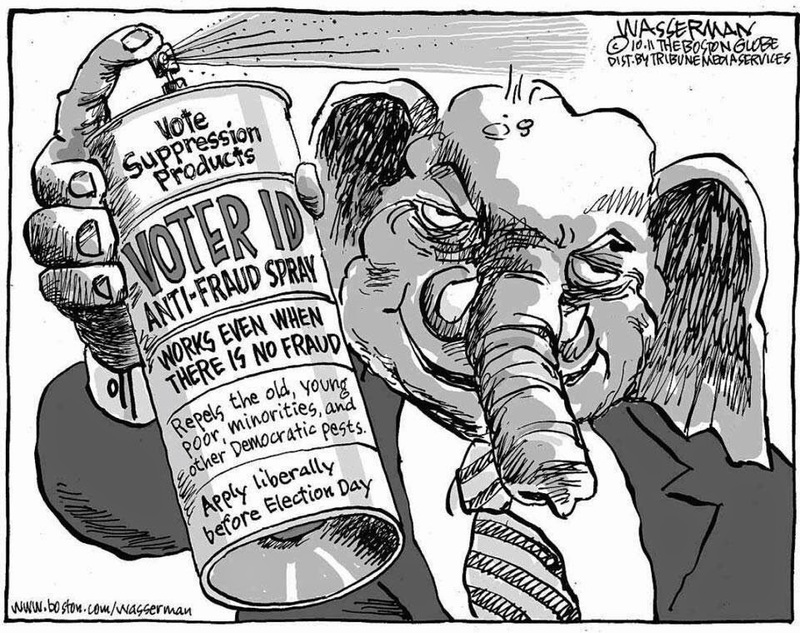 Republicans are determined to get out their base and to suppress the vote of everyone else. 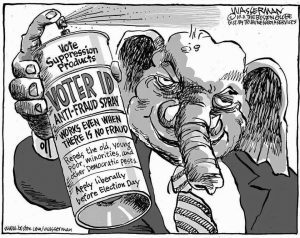 Many of the new Republican voting laws complicate the notion of a “valid id.” The New Hampshire Supreme Court just struck down a GOP-led effort targeting students. Alternet reported, “[The] court struck down a law the GOP had passed in 2017 to impose additional residency restrictions on voters that was crafted to suppress the votes of Democratic-leaning college students.” There have been similar victories in Iowa (http://www.governing.com/topics/politics/tns-iowa-voting-rights.html) and Wisconsin. The murder of Saudi journalist, Jamal Khashoggi, spotlights the moral depravity of Donald Trump. Khashoggi was an outspoken journalist — an exemplary member of a profession Trump deplores. Khasoggi opposed the Saudi rulers — friends of Trump. Given this background, it’s no surprise that Trump is avoiding meaningful response to Khashoggi’s assassination. To understand how this killing became a major Trump scandal, we must follow three threads. The first is the relationship between Jamal Khashoggi and his country. In 1958. 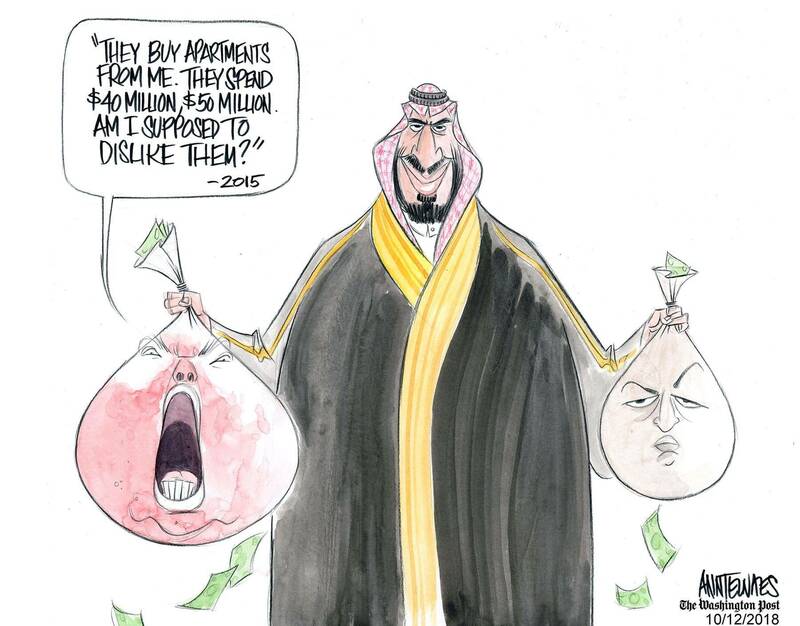 Khashoggi was born into an affluent Saudi family. He went to Saudi schools and then came to the U.S., receiving his college degree at Indiana State University in 1982. Khashoggi returned to Saudi Arabia and became a journalist; during the next twenty years he traveled extensively, interviewing many Middle East luminaries including Osama bin Laden (https://www.businessinsider.com/missing-saudi-journalist-jamal-khashoggi-ties-to-osama-bin-laden-islamists-2018-10 ). In 2003, the Saudi Ministry of Information removed Khashoggi from his post as editor of Al Watan and he moved to London. In 2007, Khashoggi moved back to Saudi Arabia and again became editor of Al Watan. In 2010 he was fired for criticizing the government. Nonetheless, he continued to write columns, and provide TV commentary, for a variety of media outlets. In December 2016, the Saudi authorities banned him from writing columns or appearing on television. Early in 2017 Khashoggi moved to the United States and began writing for the Washington Post. Khashoggi’s Post columns were sharply critical of the Saudi government, particularly Crown Prince Mohammad bin Salman — next in line for the Saudi throne. In April 2018 Khashoggi wrote that Saudi Arabia, “should return to its pre 1979 climate when the government restricted hard-line Wahhabi traditions. Women today should have the same rights as men. And all citizens should have the right to speak their minds without fear of imprisonment.” He criticized Saudi intervention in Yemen and the government crackdown on media and dissent. Khashoggi even established a Saudi political party, Democracy for the Arab World Now. There’s strong evidence that Jamal Khashoggi was murdered, on October 2nd, at the direction of Mohammad bin Salman. The Crown Prince doesn’t like to be challenged. Neither does Donald Trump. Not surprisingly, Trump shows no interest in putting pressure on the Saudis. 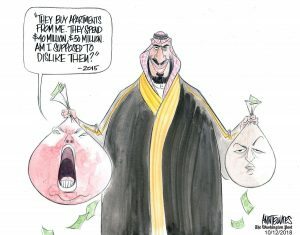 It’s been suggested that he should threaten to withdraw from his touted “$110 billion” arms deal, to force the Saudi’s to cooperate. He’s unlikely to do this. Since May of 2017, the White House has touted “a $110 billion Saudi-funded defense purchase … which will grow to $350 billion over the next 10 years.” But it turns out that most of the $110 billion consists of “memorandum of intent” and only $14.5 billion are covered by the firmer “Letters of Agreement.” (https://talkingpointsmemo.com/news/trumps-110-billion-saudi-arms-deal-doesnt-actually-exist ) In other words, Trump is lying about this arms deal. The Trump Administration isn’t going to do anything about the murder of Jamal Khashoggi. Just like they haven’t done anything about the murders of other brave journalists in Russia and other parts of the world (https://www.theguardian.com/commentisfree/2018/oct/09/the-guardian-view-on-the-killing-of-journalists-the-truth-in-peril ). They don’t support freedom of the press. Donald Trump isn’t going to do anything about the murder of Jamal Khashoggi because the crime was consistent with Trump’s attitude about the press. He wants to impose his own Iron Curtain. Who will be the first American journalist to die? There are many reasons to dislike Donald Trump. He’s an unrepentant sexual predator, who lies without remorse. In addition, Trump is a bigoted bully whose only moral precept is “might makes right.” Nonetheless, the most important reason to dislike Donald is that he refuses to protect our children and grandchildren. Trump is obsessed with immediate gratification and. therefore, has chosen to ignore global climate change. Now it’s coming home to bite all of us. If you blinked, you missed the October 8th report of the United Nations Intergovernmental Panel on Climate Change (IPCC) (http://www.ipcc.ch/report/ar5/). It’s very disturbing; if we don’t take immediate action to control emissions, we’re screwed. More about that later. You may have not seen the IPCC climate change report because the mainstream-media focus quickly shifted to the fight between Donald Trump and Taylor Swift. And then to sexual predator Brett Kavanaugh’s first day on the Supreme Court — by the way, he has four female clerks. Or, if you live in the southeast, you may have been preoccupied with Hurricane Michael bearing down on the Florida panhandle. If you’re among the unfortunates living on the coast of Alabama and Florida, I sympathize with your situation. 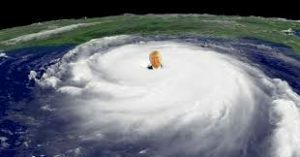 Perhaps, as your considering the hurricane damage, you’ll have a moment to reflect that you, too, are a victim of global climate change. These days, that’s the pattern: people don’t pay attention to climate change until it comes to their neighborhood. Every American has an opinion about climate change, but few of us rank it as an important concern when deciding who to vote for. Instead, prospective voters focus on the near term: healthcare costs, jobs and the economy, or guns. This is the recurring pattern when Americans ponder climate change: they decide it’s too abstract or difficult and they don’t do anything about it. Unless you are fortunate enough to live in California. In August, Quinnipiac ran a small poll (175 respondents) that asked: “Do you think the United States is doing enough to address climate change, doing too much, or do you think more needs to be done to address climate change?” 64 percent responded “more needs to be done;” the highest number since Quinnipiac started asking the question. (And “doing too much” or “doing enough” were at all all time lows.) The pollsters added a new follow-on question: “The wildfires in California are the worst in the state’s history. Do you think climate change is a factor in making these fires more extreme, or not?” 53 percent of respondents believed climate change was a factor. In California, we take climate change very seriously and a strong majority believes that climate change was a factor in our fires. A recent Public Policy Poll ( http://www.ppic.org/publication/californians-views-on-climate-change/) found that 80 percent of Californians view climate change as a serious “threat to the state’s future economy and quality of life.” (California Democrats and Independents view climate change more seriously than do Republicans — only 22 percent of Trump’s Party see it is a threat; they’re more worried about Taylor Swift.) Californians have to take climate change seriously; a recent report indicated that the frequency of major fires will increase by 77 percent by the end of the century. In California we’re taking a variety of actions to stem the tide of climate change — such as limiting our carbon emissions — because we understand that we don’t have a choice. Meanwhile, the October 8th IPCC report indicates that the world is rapidly reaching the point of no return: “We are on track to cross a key threshold of danger —1.5 degrees C or 2.7 degrees F—much earlier than anticipated: 2040.” (A 1.5 degree Celsius increase is the point at which irreversible sea level rise, massive coral reef extinctions, and food shortages begin to occur.) In California, this would increase the severity of fires and the probability of drought. It would also increase flooding along the coast and raise the probability that salt water would intrude into the Sacramento-San Joaquin delta — an event that would have cascading consequences, threatening drinking water supplies and impacting farm land. California is taking steps to deal with this and it’s likely Florida will join us. The day the IPCC report appeared, Florida got news that Hurricane Michael was heading their way. (On the afternoon of October 10th, Michael hit the Florida panhandle with winds between 115-155 mph.) It’s the third major hurricane to hit Florida in the past 3 years. It’s not Florida’s only global climate change event. For almost a year, Florida has been beset by the “red tide” (https://www.vox.com/energy-and-environment/2018/8/30/17795892/red-tide-2018-florida-gulf-sarasota-sanibel-okeechobee ), which has killed: “At least a hundred manatees, a dozen dolphins, thousands of fish, 300 sea turtles, and more have died or washed along shores in putrid-smelling masses.” The red-tide has become a factor in Florida’s election: Republican Governor Rick Scott exacerbated the situation by cutting Florida’s water-management budget. Meanwhile, the Trump Administration chose not to respond to the IPCC report. When queried, Donald said, “It was given to me, and I want to look at who drew it… Because I can give you reports that are fabulous, and I can give you reports that aren’t so good. But I will be looking at it. Absolutely.” Trump isn’t going to read the report and he isn’t going to lead an effort to protect our children and grandchildren from future harm. The confirmation process for Brett Kavanaugh began on September 4th, quickly devolved into a demolition derby, and finally has reached it’s ultra-partisan conclusion. Kavanaugh will be confirmed as a Supreme Court Justice. Republican actions will live on in infamy. And Democrats are united in righteous anger. This 33 day process established several things. First, Brett Kavanaugh is unfit to be a Supreme Court Justice. At first, many of us opposed him because we thought his views were too extreme — he will, I’m sure, oppose Roe v. Wade and any other law that lets women make their own health decisions. (And he is a corporatist who will side with corporations, and the wealthy, in cases that pit these interests against working folks.) But, as he we got to know Kavanaugh — through the determined efforts of Senators like Cory Booker and Kamala Harris — we realized that he’s a liar; that he had lied to Congress (https://www.motherjones.com/politics/2018/09/five-times-brett-kavanaugh-appears-to-have-lied-to-congress-while-under-oath/ ) And then, because of the courageous efforts of Christine Blasey Ford, Deborah Ramirez, and other women, we learned that Kavanaugh had (or has) a drinking problem and, when he drank to excess, assaulted women. The second thing the Kavanaugh hearings established is that the Republican Party, run by old white men, will say and do anything to win. The GOP has embraced the morality that “the ends justify the means.” This shouldn’t come as a surprise; after all, the Republican Party decided to invade Iraq because they needed a wining issue for the 2002 mid-term elections. What’s so disappointing is that the entirety of the Republican Senate — with the exception of Senator Lisa Murkowski — has gone over to the dark side. No longer can we find a handful of Senators — such as the late John McCain — who, on occasion, were willing to do what’s right; who were willing to declare that Emperor Trump has no clothes. The Republican party has lost its moral compass. 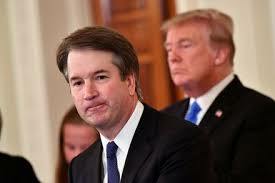 The third thing we learned from the Kavanaugh hearings is that the Republican Party is Trump’s Party. Trump pushed through a totally unfit Supreme Court nominee and, in the process, he forced the GOP to submit to his will. With the exception of brave Senator Murkowski — and for a few minutes Senator Jeff Flake — no Republican was willing to stand up to Trump. They will not stand up to an unrepentant sexual predator and habitual liar. There’s strong feeling about the Kavanaugh confirmation process. Watching Christine Blasey Ford’s September 27th testimony, many sexual-assault survivors were re-triggered. They were not pleased with the way the Republican-controlled committee handled Professor Ford — or Kavanaugh’s other accusers — and they were angered by Donald Trump’s mocking Professor Ford on October 2nd. As a result of this painful process, Democrats, and their allies, are angry at Donald Trump and his Republican Party. Now they plan to channel their anger into work related to the November 6th midterm elections. The 538 website (https://fivethirtyeight.com/features/is-kavanaugh-helping-republicans-midterm-chances/ ) just cited a poll that concluded: “more voters would be angry than enthusiastic if Kavanaugh was confirmed.” That confirms what we’re seeing on the Left Coast. There’s a big money and determination gap between Democrats and Republicans. Nonetheless, two incumbent female Democratic Senators were hurt by their opposition to Kavanaugh: Missouri Senator Claire McCaskill and North Dakota Senator Heidi Heitkamp. Their bravery merits support. Finally, the Kavanaugh hearings established once and for all that the Republican Party can no longer claim to represent orthodox Christians. Surely no political Party that consistently lies and supports the moral tenet that the ends justify the means, can claim allegiance to the teachings of Jesus of Nazareth. In the Beatitudes, Jesus said: “Blessed are those who hunger and thirst for righteousness, for they will be filled.” On October 6th, 2018, it’s the Democratic Party that hungers and thirsts for righteousness. With 30 days of hard work, our quest for righteousness will be fulfilled.